Lissenung Island Resort is like a small paradise in the middle of the South Pacific, just one resort on a pretty, secluded island. The island is a short boat ride away from Kavieng, fantastic reefs which are amongst the finest in PNG and has a fully qualified PADI dive centre on site. Lissenung Island has a soft pink sand beach, which is extremely rare in PNG; the perfect place for happy hour drinks as the sun goes down. Lissenung Island Resort has come a long way since the mid-1990s when the little resort appeared on the international dive market. The rough edges have long been smoothed over, and without changing the lovely and unpretentious setting of this quiet and remote island, Dietmar and Ange, the owners of Lissenung Island have made considerable improvements to the accommodations and facilities. 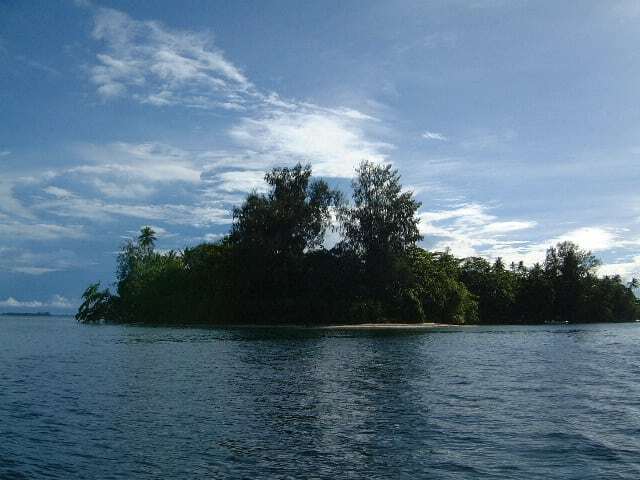 Nearby Kavieng, the main town of New Ireland province, is a remote area even by PNG standards. Supply ships arrive irregularly, and produce we take for granted at our local supermarkets may be scarce for months at a time. Under these difficult circumstances, the inventive menus prepared in the Lissenung kitchen deserve high praise indeed, as does their little herb and vegetable patch. Fish, lobster, crayfish and chicken feature quite often, and vegetarian versions may also be ordered at any time. Meat and milk products are always difficult to find in this part of the world. 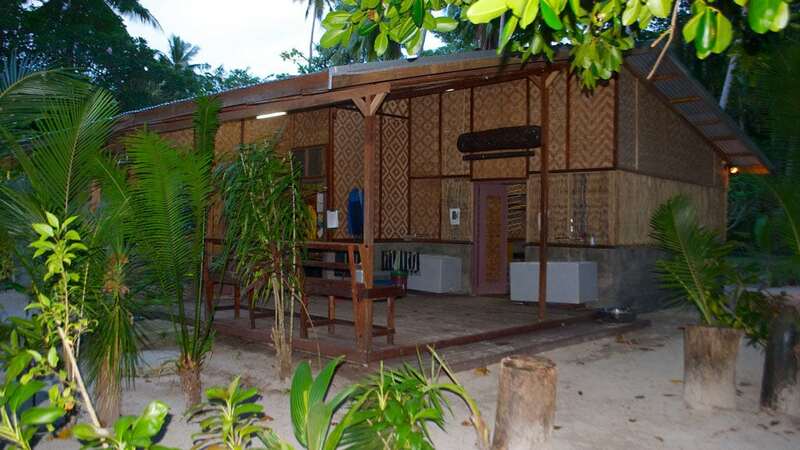 Almost all of the 7 rooms now feature spotlessly clean, modern en suite bathrooms, spacious covered verandas (some with daybeds), gleaming wooden floors and the intricate woodwork the Kavieng region is famous for. There are three bungalow blocks, each bungalow has two private rooms. Six rooms have their own private facilities. 1 room has shared shower and toilet building which are just a short stroll away. An on-demand hot water system has been installed in all standard room bathrooms for hot showers. Every room has ceiling fans, fly-screens and mosquito nets. Sandy pathways, fringed by fragrant floral plants and tropical shrubs, meander between all bungalows and beach facilities. At night tiki lights lead the way to the main house. 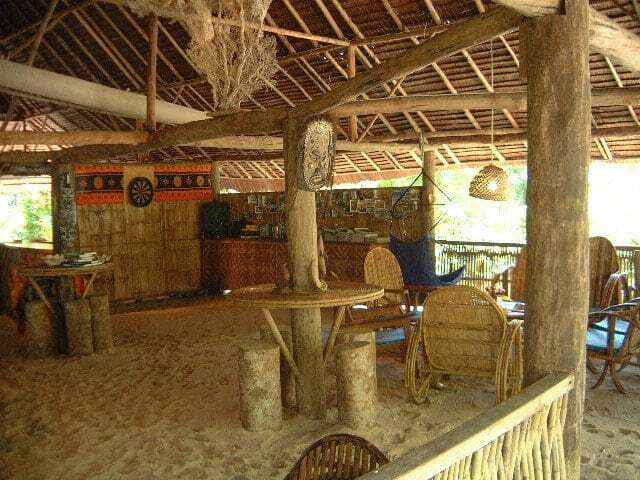 The main house was designed to let nature in, with a sandy floor, handcrafted furniture and comfortable lounges and beautifully decorated with masks and other local artwork. This is where everyone comes together a few times a day for lovingly prepared meals, games and stories or a quiet afternoon with a good book. Next door and adjacent to the dive shed is the newly-built, spacious and air-conditioned office with separate desks for guests who would like to send emails or digitalise their photographs. 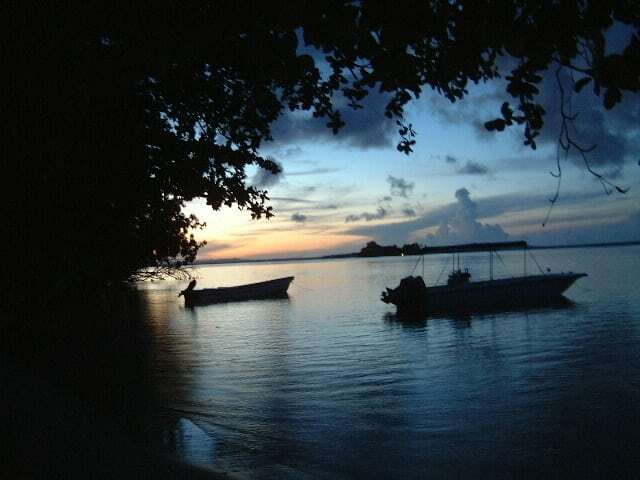 Excursions to neighbouring islands and village visit are easily arranged. With a maximum of only 14 divers and snorkelers, Lissenung is often booked out by families or friends travelling together and thus enjoying their own private island, and even fully booked this island will never feel crowded. 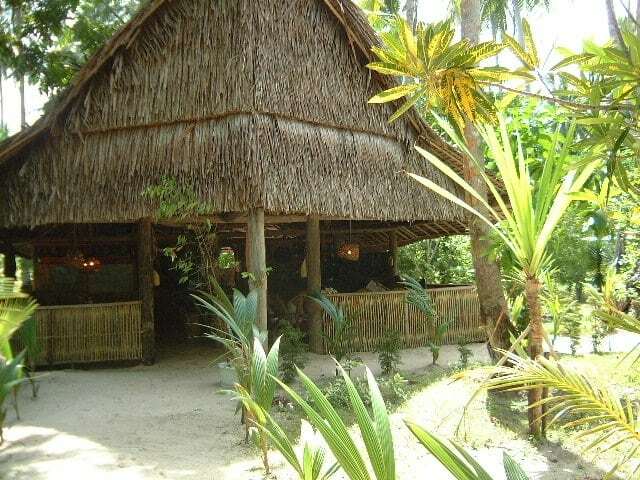 Lissenung Island Resort has reliable mobile phone reception. Prepaid local SIM cards are available. Some rooms and all common areas have free wireless internet access for guests. The resort also provides a guest computer for internet access upon request. Lissenung Island is a small paradise in the middle of the South Pacific – just one resort on a very pretty island. This pearl of an island is very close to fantastic reefs which are amongst the finest in PNG, and just a short boat ride away from Kavieng. Daily boat trips to the outer reefs, drop offs and wrecks with a maximum of three dives per day are offered. The day trip usually starts at 8.30am with 2 morning dives and returns to the island for lunch. In the afternoon, you can either go out for a third boat dive, relax on the island or do a shore dive on the fabulous house reef. 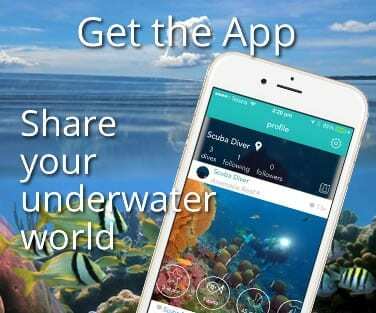 For divers staying at Lissenung and booking boat dives in the morning, these shore dives are free of charge. With over 300 different species of fish, the house reef is a nice little added bonus! It is also the spot to do night dives, with another whole bunch of different fish, molluscs and crustaceans coming out to play and feed. Water temperature in this area ranges from 28–30°C (83–87°F) all year round and underwater visibility from 20–40m (60–120Ft) on most dives. 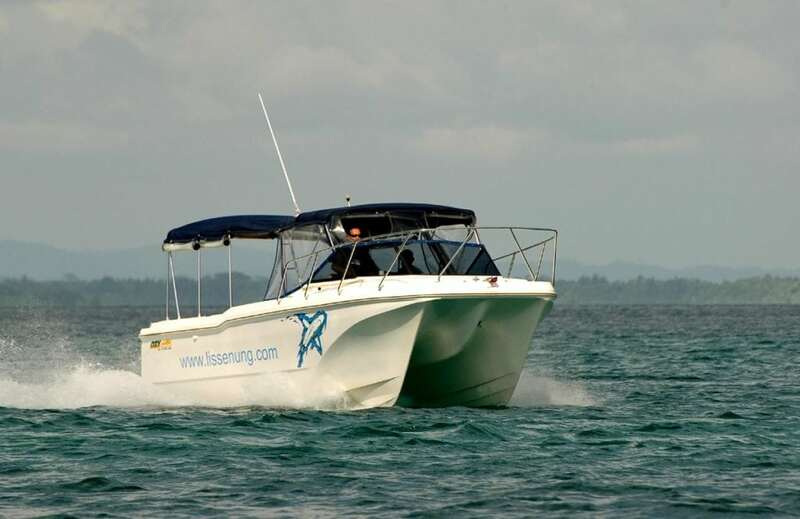 The resort’s three dive boats are perfectly designed for diving. Each boat is equipped with a dive ladder, canopy for sun protection, equipment boxes and tank racks. The dive boats will have you at any of the dive sites within 20-30 minutes. The larger dive boat “Andiamo” is a 26Ft fibreglass boat with twin 140HP 4-stroke Suzuki outboard engines and can comfortably carry 10 divers, 2 dive guides and the driver. The two smaller dive boats, “Raven” and “Carola” are ideal for small groups. “Raven” is a 24Ft fibreglass boat with a single 115HP 4-stroke outboard engine (takes 6-8 divers). 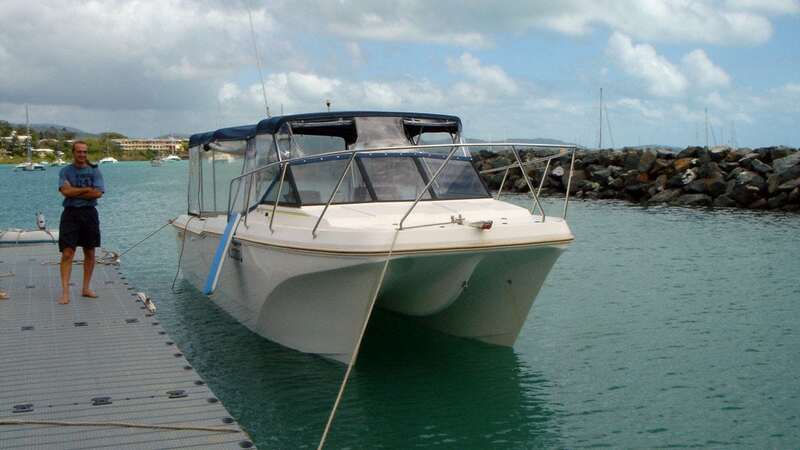 “Carola” is a 23Ft fibreglass boat with a single 75HP outboard engine, (for 4-6 divers). A DAN oxygen unit for emergency situations is on board each boat and the dive staff are trained in its use. Dietmar has been running the dive operation for many years and is an expert in picking the right dive spots at the right time. He also offers dive courses. Experienced local dive guides lead all dives, and multi-lingual PADI dive instructors take care of beginner divers and students. 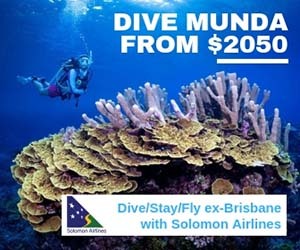 Day trips for divers staying in other hotels in the Kavieng area are also available. Lissenung Island is surrounded by many other low tropical islands, which channel the waterways between Pacific Ocean and Bismarck Sea. Medium to strong currents are common and often unpredictable, which is good news for any diver interested in drift diving and pelagics, but there are always calm spots to be found as well. 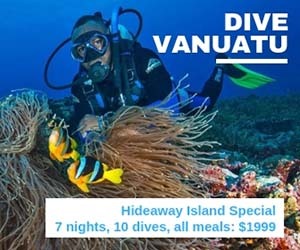 This dive region has everything: year-round warm water in all shades from turquoise to purple (at least 29°C/90°F or more), massive coral walls for drift diving or leisurely exploration when the currents don’t run, shallow and sandy spots near the islands for critter-spotting and muck diving, and quite a few WWII wreck dives, mostly small planes. With more than 50 world-class dive sites, you would need at least 3 visits to Lissenung Island to experience them all. There are also sheltered reefs and, of course, a number of very accessible wrecks that can be dived. Some great muck diving is available also in close proximity to the island. Last but not least there is a great bonus feature: Located just off the beach (just a few fin kicks away) is the very entertaining, 10m deep house reef. At least 175 different species of fish have been counted on the house reef, and it’s continually growing. 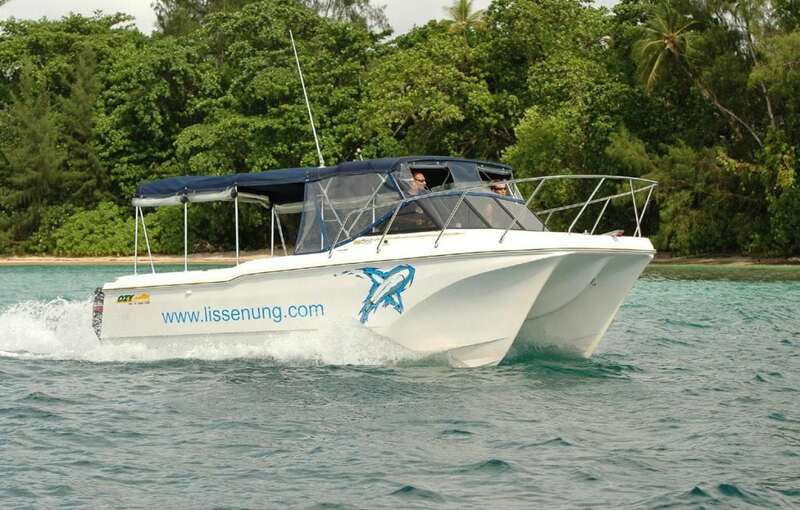 You get free shore day-diving on Lissenung’s house reef while staying at Lissenung Island Resort! Interesting for day (for free as many as you like before 6pm) as well as night dives (night dives are guided and will be charged locally). Albatross Passage is one of the most diverse dive sites and only 10 minutes by boat from Lissenung. 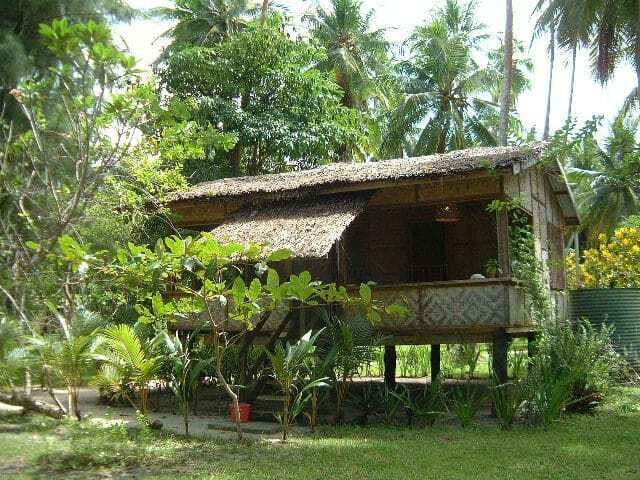 All year round, you can extend your stay at Lissenung with a village guest house stay at remote Tsoi Lik Island(minimum number of divers required). This is a truly unique experience. Apart from visiting dive sites that are rarely visited like Big Fish Reef and Turtle Reef, you will get a much better idea about the reality and beauty of Pacific Island life. 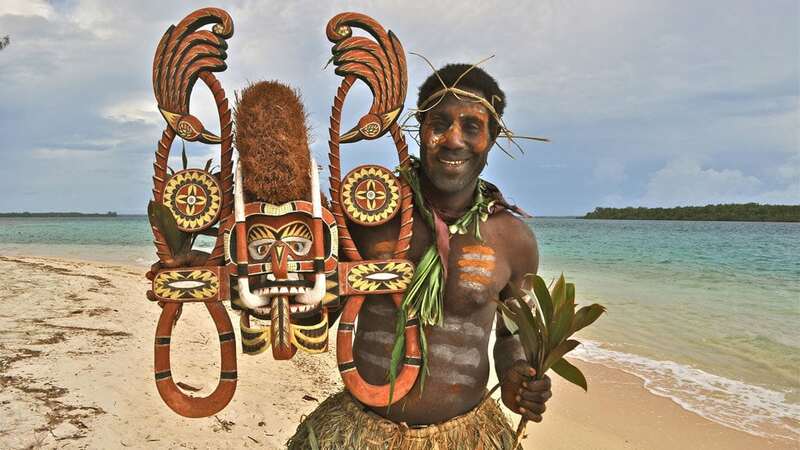 Incidentals can be paid at the resort in cash PNG Kina, AUD, USD and Euro. For all local purchases, a 10% GST applies. Visa and Mastercard are accepted at no service fee. This is the perfect place to unwind from stressful city life and stay close to nature, listening to the birds in the trees and the waves lapping on the beach.